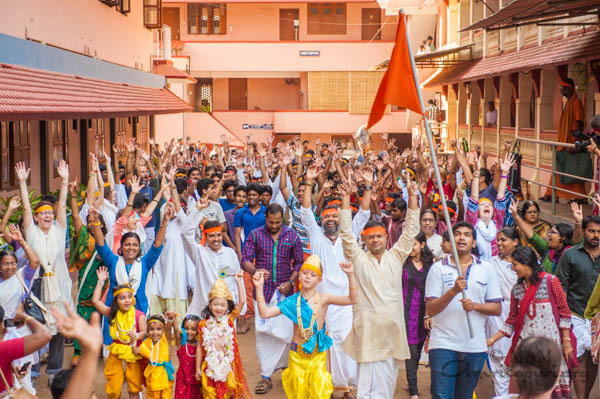 Like each year before it, the day of Krishna’s birth was celebrated in Amritapuri in a very festive atmosphere and music and bhajans were everywhere; it was a true celebration. 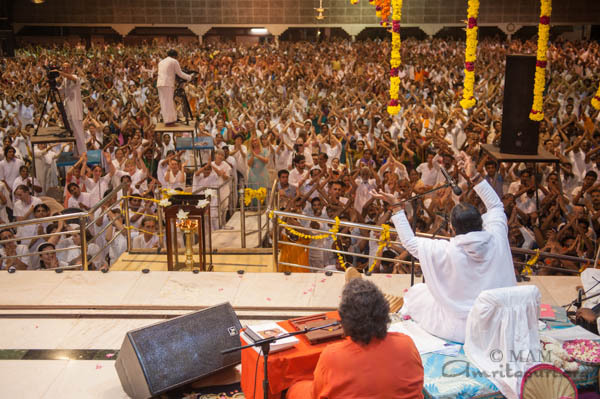 Early in the morning after crowds of people paraded through the ashram enthusiastically singing namavalis and Gopuja was performed. 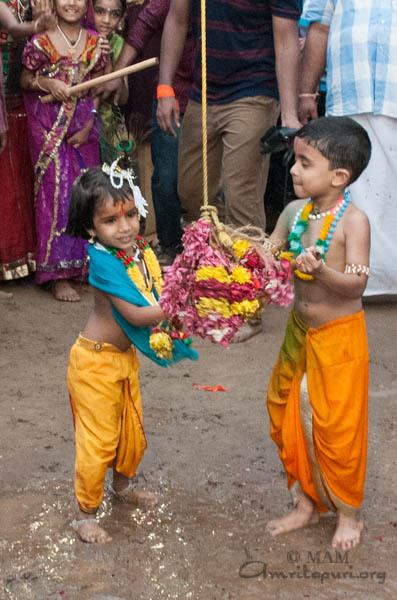 Little gopis and gopas and krishnas were seen all around the ashram as many took the opportunity to dress up on the occasion and join a large procession led by the ashram elephant Lakshmi. 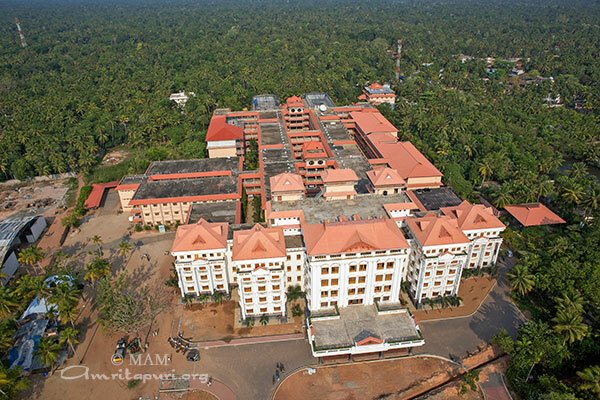 Amma came to the big hall and gave darshan to all those that had come for the festivities. 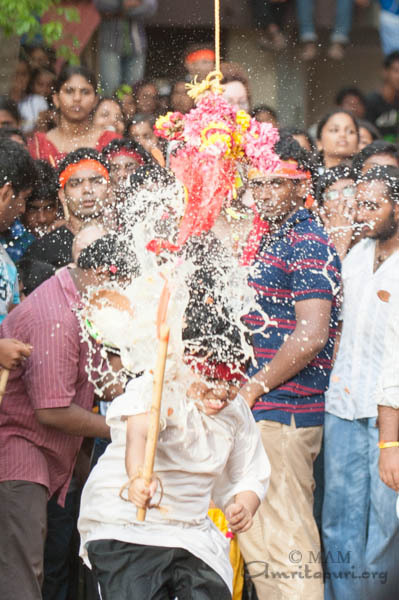 Then once all the preparations were made and the procession had returned to the front of the ashram, Amma joined with everyone to participate in the Uriyadi games. 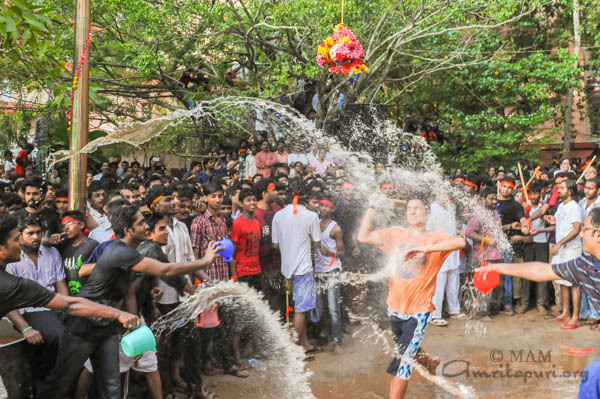 Amma sat on the temple steps and sang bhajans as everyone crowded around to watch the young participants try their best to break the small clay pots suspended from high above. 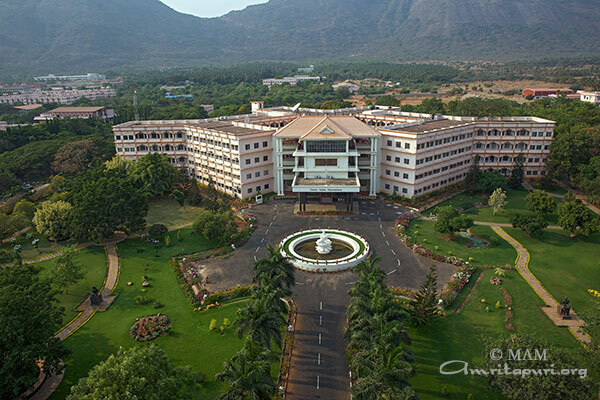 Right from Uriyadi everyone followed Amma back to the big hall for the evening bhajans which were highlighted by several beautiful Krishna bhajans. But the main event was still to come. After dinner, Amma came back to the stage for the grand finale. Amma gave her Sri Krishna Jayanthi message which was played on the big video screens. 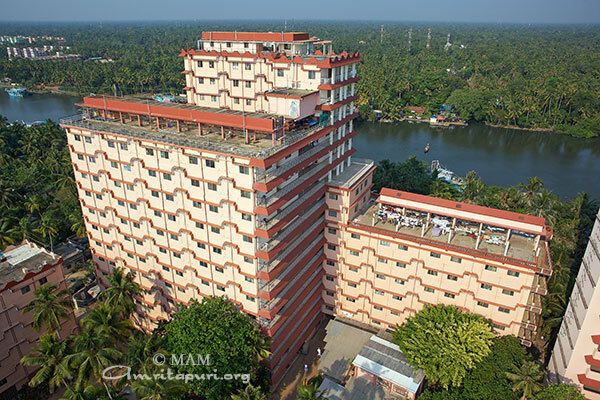 “The birthday of an ordinary person reminds us of the transience of human life, whereas that of a divine incarnation like Sri Krishna reminds us of the soul’s immortality” said Amma in her Krishna Jayanti message in Amritapuri. 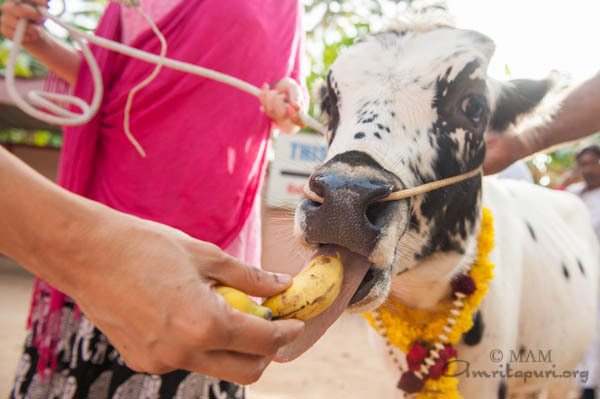 “Lord Krishna’s life is a light illumining the way to the Supreme. God assumes a human form in order to teach how humankind may rise to the level of God. Like a mother who helps her toddling child walk, God accepts all the limitations of a human body for the sake of leading us. 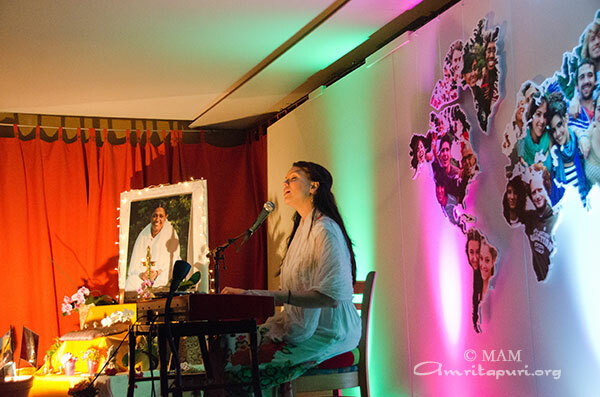 By assuming a human form, divine incarnations demonstrate how human beings ought to live” Amma said. 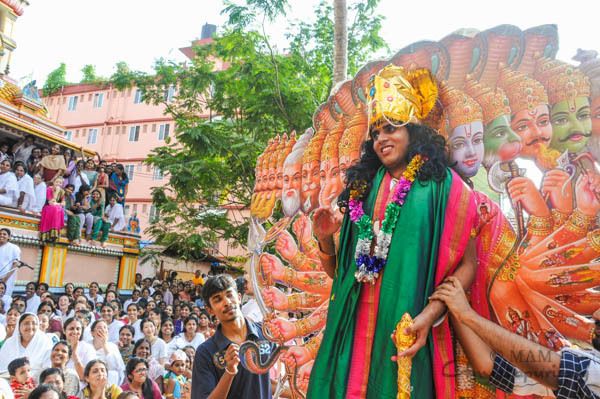 “Lord Krishna, who adorned himself with a peacock feather, continues to shine even today as the protector of Dharma and as the Guru of the world. Through his life, Sri Krishna demonstrated the duties of a son, disciple, king, servant, teacher, friend and householder. It is this fullness and expansiveness that makes Krishna a purna-avatar, a complete manifestation of divinity in human form. 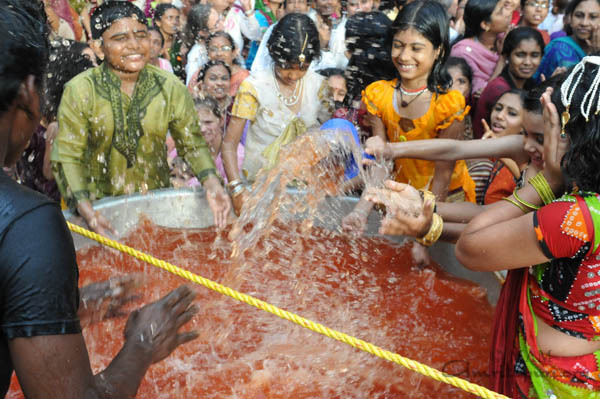 Jagat Gurus (world gurus) are those who teach truth and dharma through their lives. 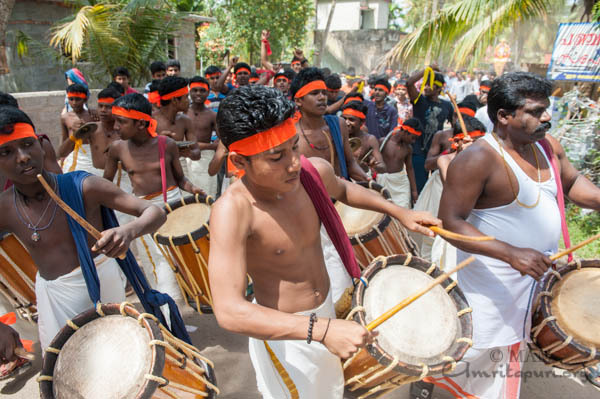 Krishna expressed different bhavas to captivate different kinds of people. 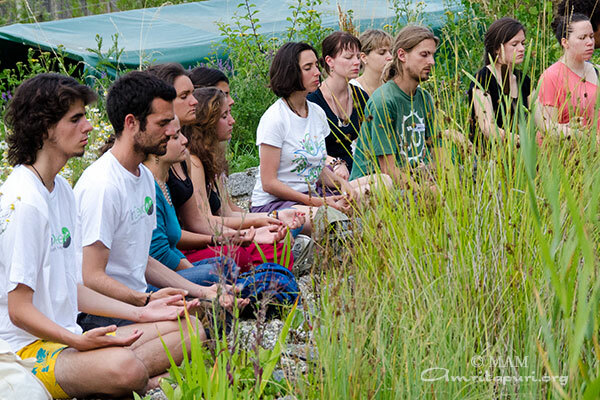 His teachings helped to uplift people of all levels, and they illumine the paths of knowledge, devotion, action and yoga. 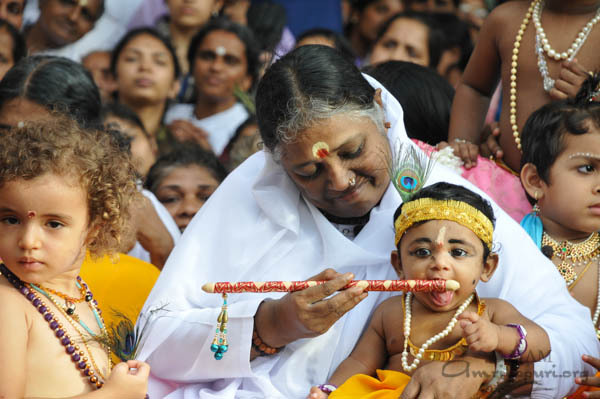 If we give up our ego and surrender to the Lord, He will protect us in all circumstances,” emphasized Amma. Then as the clock approached midnight chanting from the Srimad Bhagavatam filled the hall as a Bala Gopala Puja was being performed on stage. 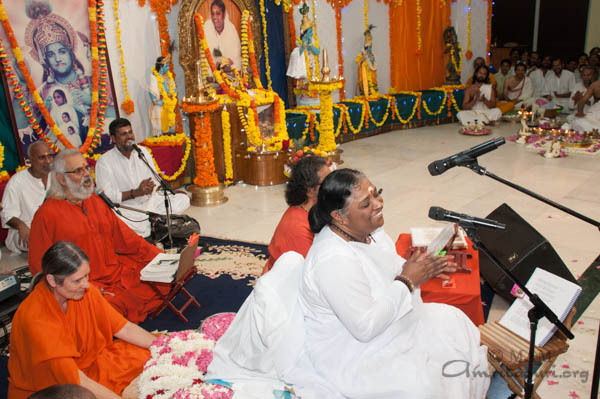 Right at midnight, the hour of Krishna’s birth, Amma began singing beautiful Krishna bhajans in a very celebratory and joyous mood, including: Agatanayi Vishnu Devan, Nanda Gopan and Katitayitaram. 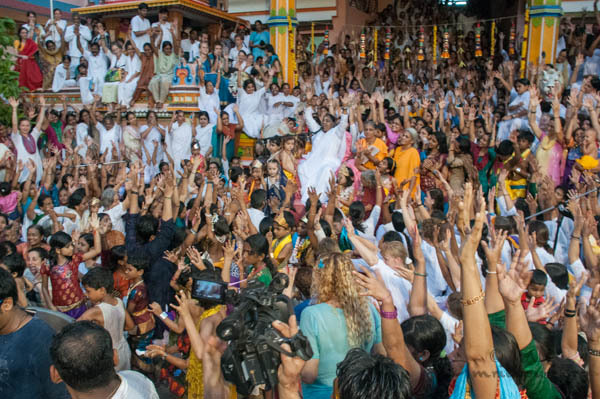 Then Amma asked everyone to stand up and forget all their worries and dance with arms raised as she continued to sing: Bhajo Re Bhajo, Manamohana Gopala and Bandha Krishna. 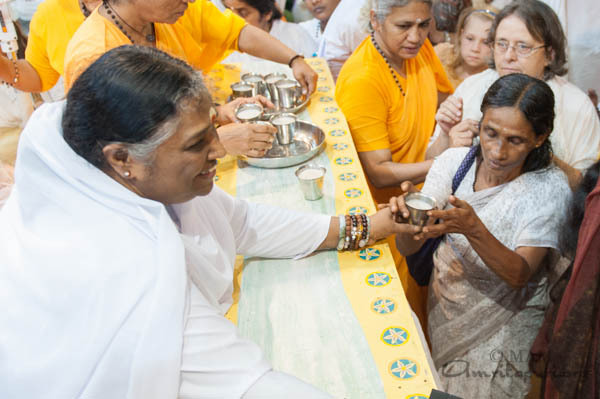 After the bhajans, by 1am Amma served sweet payasam as prasad to one and all. 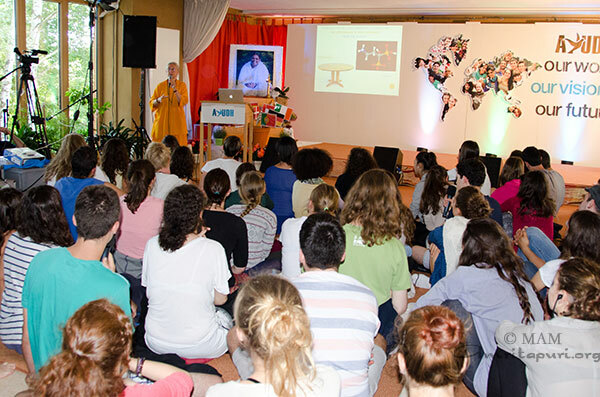 The Youth Forum is dedicated to the empowerment of youth in Tabanan, a regency of Bali had a program with Swami Purnamritananda. 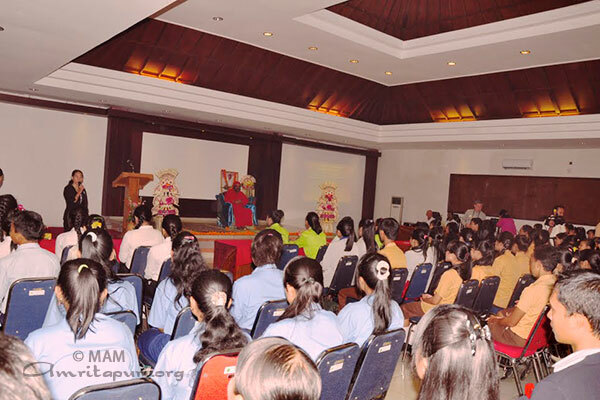 The theme of the event which Swami graced was “Rise Arjuna: Awake, Arise and Seize the Future”. Surpi, who organized the event, said in her opening speech that the youth worried about their future and wanted guidance and inspiration. 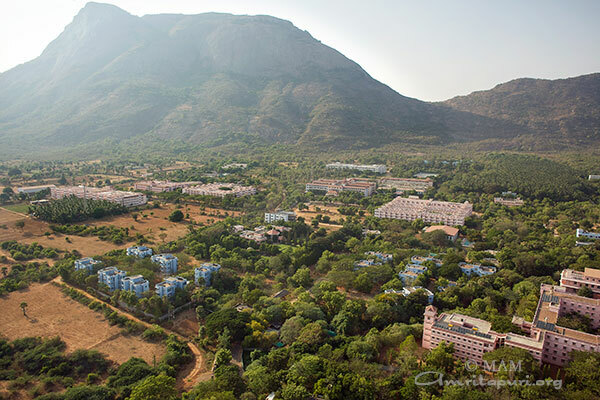 Surpi described Amma as “Active Spirituality”, spirituality that does valuable work. 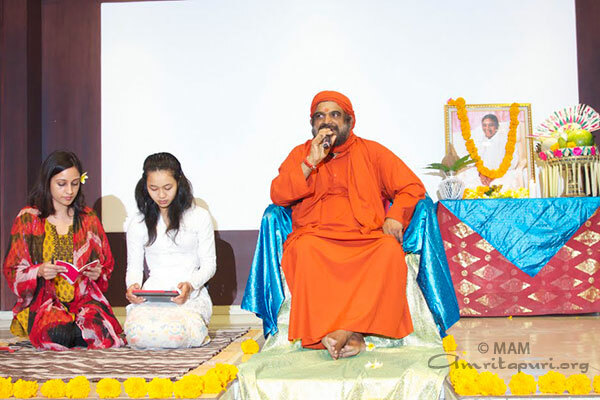 She told the youth how lucky they were to have Swamiji, Amma’s disciple, amidst them, to share his valuable thoughts of Amma’s teachings with them. 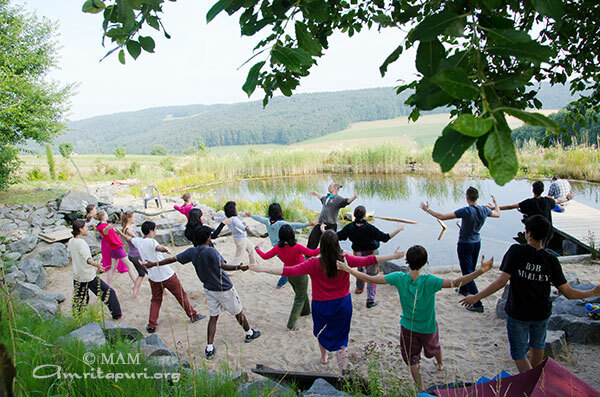 The ninth European AYUDH Youth Initiative was conducted from July13th – 20th, 2013 at MA Center Germany, Brombachtal. 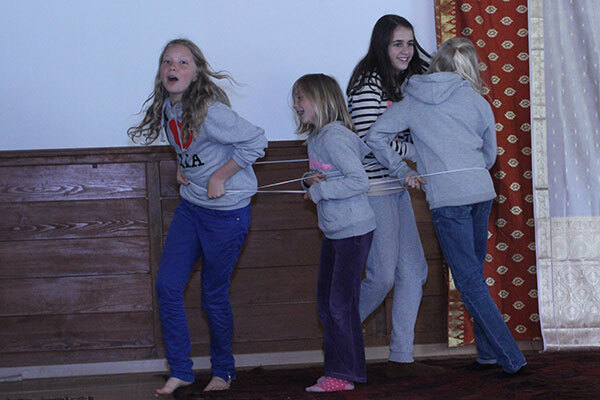 More than 200 young people between the ages of 15 and 30 participated in the week long camp. For the first time participants from Greece, Denmark and Lebanon took part in the initiative, making it a total of 21 nationalities present. 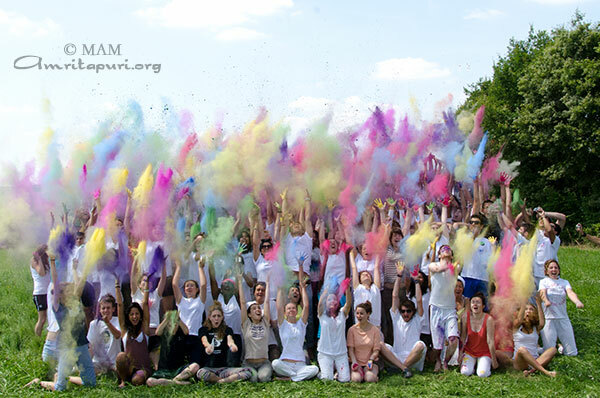 The initiative included youth from: Germany, Austria, Switzerland, Spain, Portugal, Italy, France, the Netherlands, Belgium, Denmark, Finland, UK, Ireland, Greece, Slovenia, Poland, India, Singapore, USA, Canada, and Lebanon. 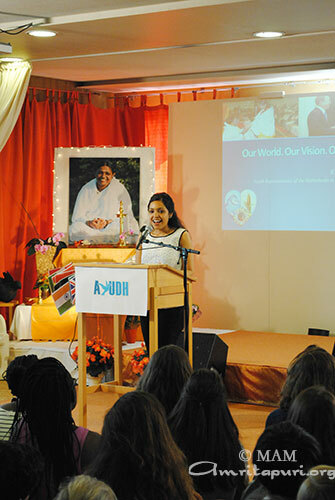 “Our World -Our Vision- Our Future” was the theme for this year’s camp. The participants were invited to reflect upon their ambitions and dreams. Interactive talks and workshops by renowned personalities from the fields of spirituality, politics, music, dance, theatre, and media inspired the youth to define their personal vision and take practical steps to reach their goals. 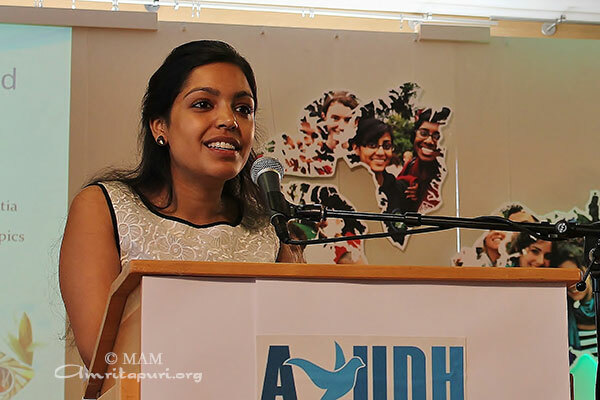 Kirty Matabadal, the current Youth Ambassador to the UN (Netherlands) addressed the conference. 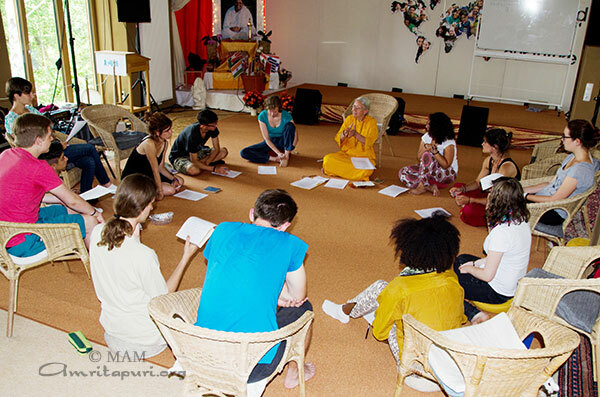 The feedback that she had collected from the AYUDH participants last year was included in her speech which she gave in front of the UN General Assembly in New York on 8th Oct 2012. This time she challenged participants to debate about the future of the planet in regards to food security: “Today there are 7 billion people on this planet. We produce food for 12 billion people, 1 billion is facing starvation and 1,5 billion are obese. Where do we go wrong?” The answers by the youth ranged from sustainable education for children, awareness campaigns to localized food production. These ideas will be presented at the conference ‘Eat2Feed’ with the Dutch Foreign Minister, organized on World Food Day 2013. Jani Toivola, a Member of Parliament from Finland, shared his experiences of growing up as a person with African roots in a society that was almost exclusively fair-skinned. 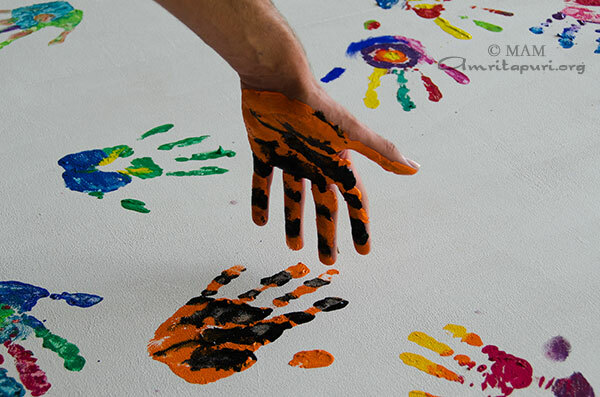 Jani told about the misunderstandings, discrimination and fear he faced as a child. Through self-acceptance and tolerance he gained the strength to overcome these obstacles and become a successful actor and later politician in Finland. As a member of parliament Jani today campaigns for minority and immigrant rights, youth employment and development aid. A completely different angle on following one’s vision was given by Aart Huijg (Netherlands), who cycled 34,000 kilometers from the North- to the South Pole: “I took the decision to take this 620 day long trip simply for one reason – because I knew that I could! I knew that anything was possible if only I believed in myself.” Aart faced many adverse situations, physical exhaustion and survived on just 5 Euro per day – enough to eat, but not enough to pay for a smartphone! Bri. Dipamrita Chaitanya outlined how an optimistic vision of life can greatly enhance our level of happiness, contentment and health. Her talk was interspersed with interesting anecdotes and inspiring videos. 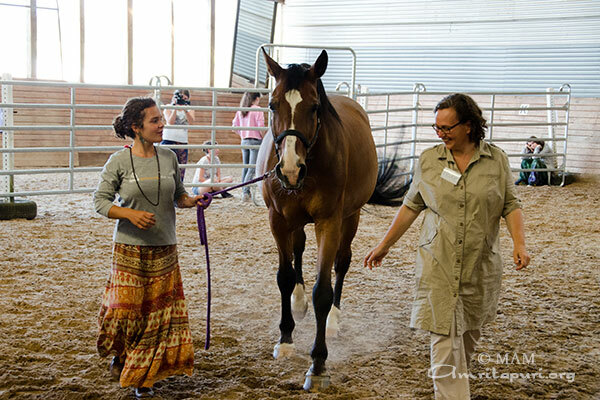 In the afternoons participants could choose between a diverse range of workshops: Finding flow in everyday life (psychology), story-telling & improv-theatre, youth-IAM meditation, yoga & chanting, tai chi & healthy nutrition, singing, improv-dance, 5-rhythms-dance, communicating with the horses, building a labyrinth, and artwork. The photography workshop collected thousands of stunning photos. 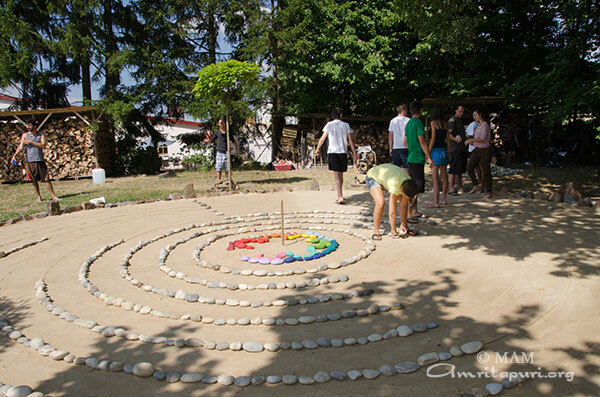 One workshop group built a labyrinth out of sand and stone in the garden of MA Center. The labyrinth, which was designed after the model of the ancient labyrinth of Chartres, France, has been used in many ancient cultures around the world as a tool for finding one’s personal vision and path in life. An exclusive harp playing workshop was led by Christina Tourin, an internationally renowned harp player and pioneer in harp-therapy. The workshop participants gave a concert at the local old age home, sharing the gift of music with the elderly residents. Christina Tourin also gifted two harps to participants of her workshop, who will continue the visits of old-age homes in Portugal and Austria. 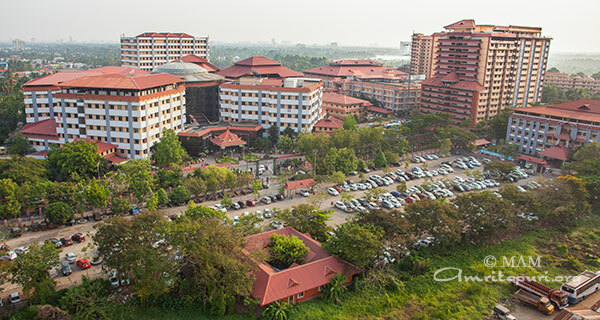 As every year, AYUDH also wants to make a contribution to the local surroundings. 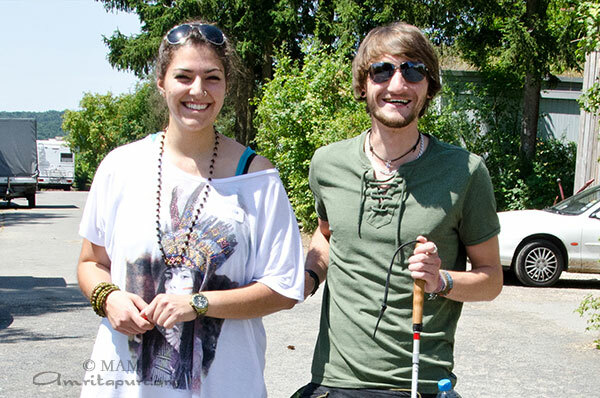 Therefore one workshop group built a barefoot path in the garden of the social care-center in Michelstadt. 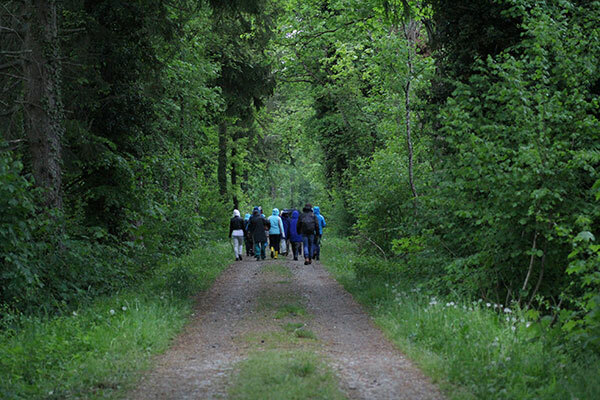 The bare-footpath is made up with natural materials and is open to people of all ages to train their sense of touch. 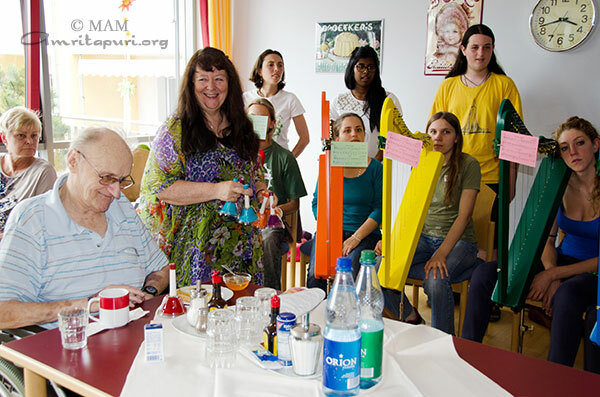 Stephan Kelbert, the Mayor of Michelstadt, praised the youth’s contribution and hard work while inaugurating it on July 19th. At least one youth from every nation participated in the In-Deed workshop, which trained them as coaches in sustainable development. 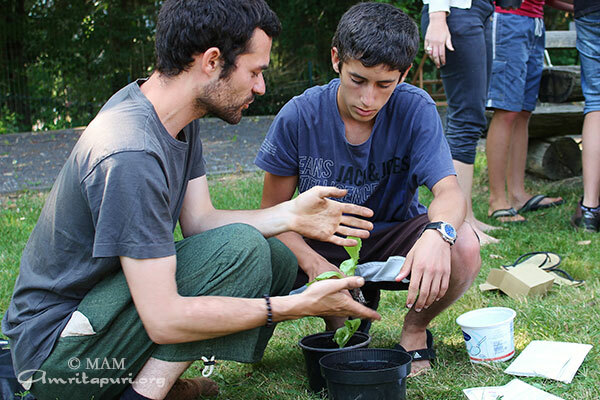 Once the youth are back in their home countries they will visit schools and child-care centers to teach the children how to save water, grow their own organic food and protect biodiversity. Upon completing the school visits, participants will be awarded with the “Youth Pass”, a certificate by the European Commission for Education and Culture. 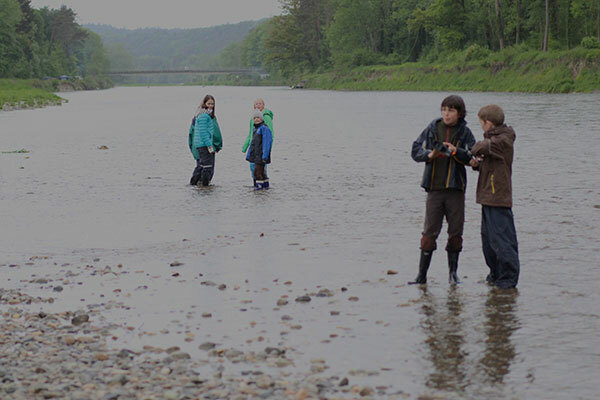 “Youth Pass” certifies non-formal learning in the youth field and is acknowledged as part of the professional career of the youth throughout Europe. 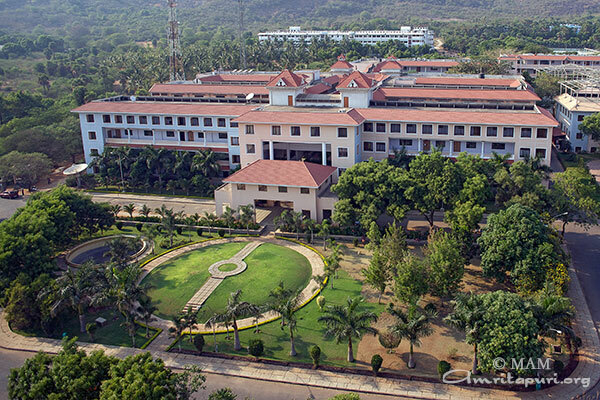 Sessions of meditation, yoga, tai chi and bhajans, were held everyday and allowed the youth to turn their vision within and integrate the diverse impressions of the day. 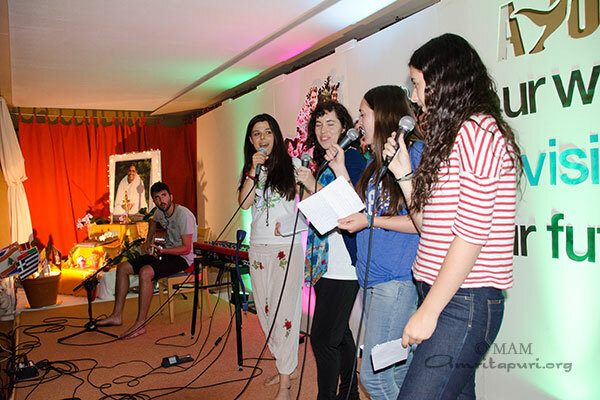 After dinner, the youth were invited to take part in interactive sessions led by Br. Shubamrita and Bri. 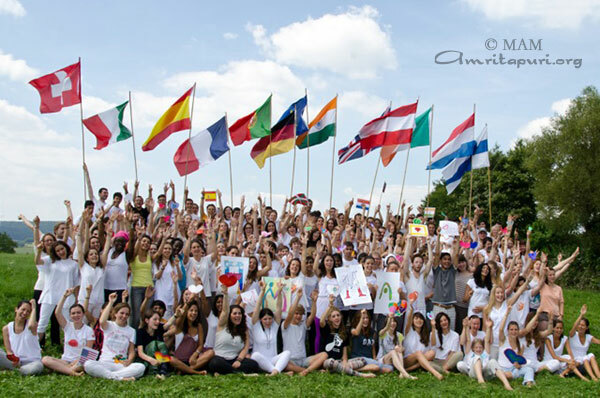 Dipamrita to reflect upon their values, personal strengths and the impact they want to have in the world. The brilliant and very mature comments sparked a lively dialogue and ended the day in a reflective mode. 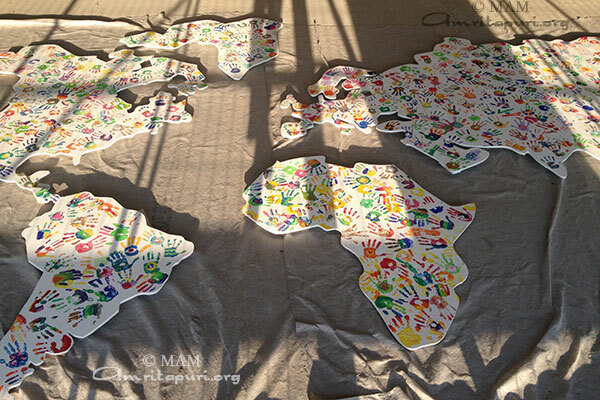 The youth undertook a huge group-art-project to literally “color the world with love.” The continents of the world were cut out in wooden pieces, which were then colored with the handprints of each and every participant. 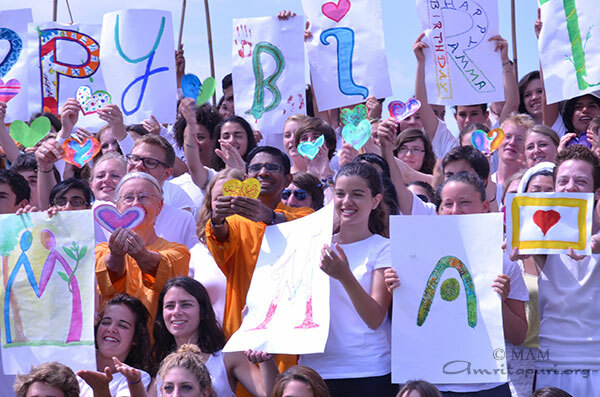 In the end, a unique mosaic of colors and shapes were created – a testimony of the youth’s willingness to work with their hands and hearts towards creating a beautiful and colorful world. 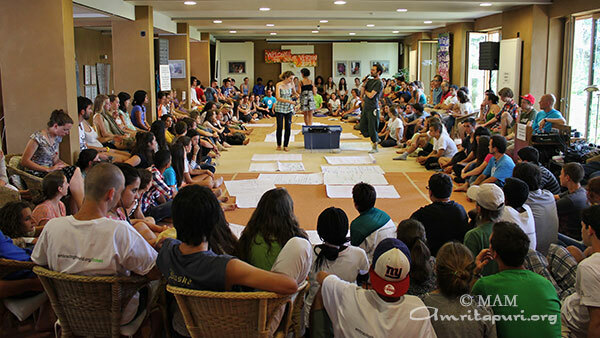 The grand conclusion of the week was a summer festival on the eve of Friday 19th July, during which each workshop presented the results of their group work. 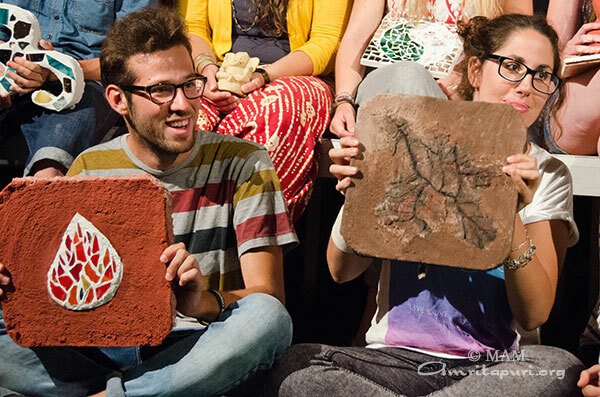 The diverse range of presentations gave an impressive demonstration of AYUDH’s talent and creativity. 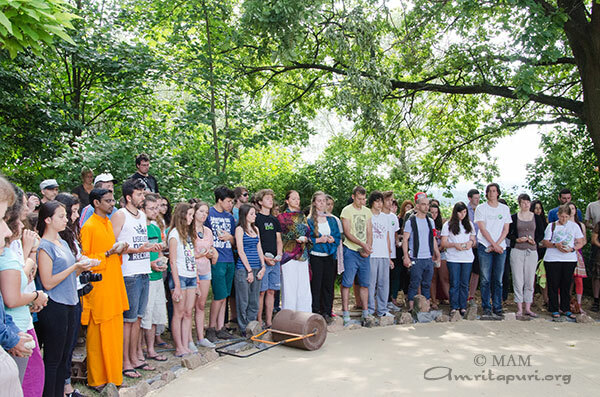 After the show, everyone proceeded to the inauguration of the labyrinth at MA Center. 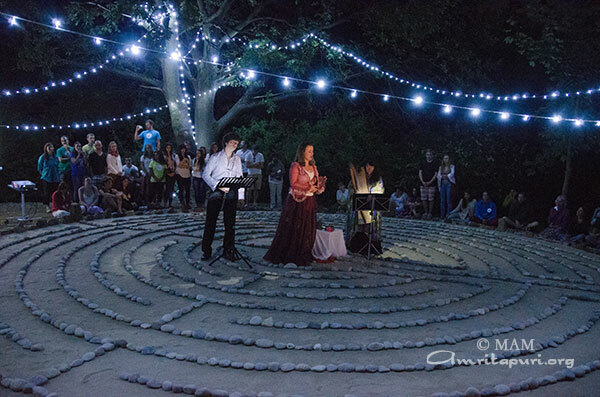 Under the light of the rising moon the youth enjoyed an exclusive classical concert with harp, flute and soprano. 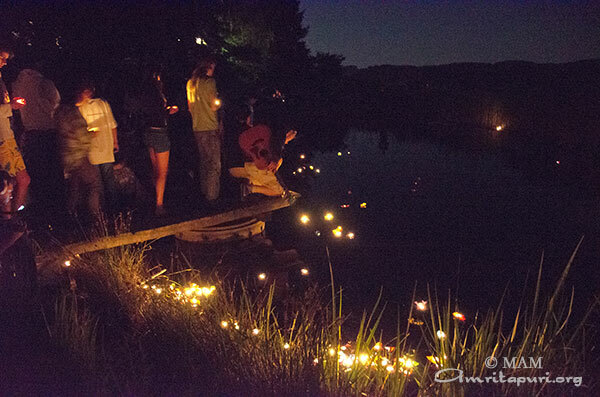 In this mystical atmosphere 300 candles were lit, which were then carried by the youth to a nearby lake, where they were set afloat onto the water. 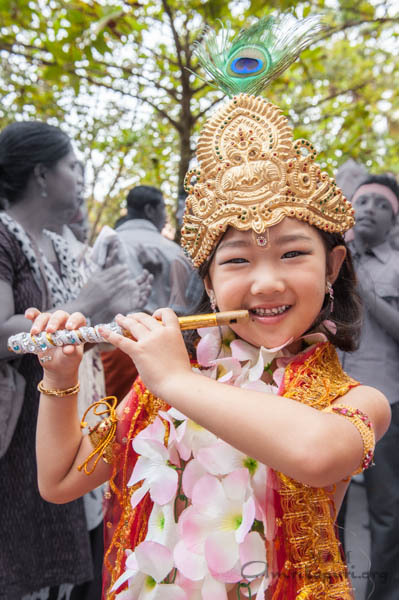 During the procession the youth sang the prayer “Om Lokah Samastah Sukhino Bhavantu” – praying for all beings in creation to be peaceful and happy. 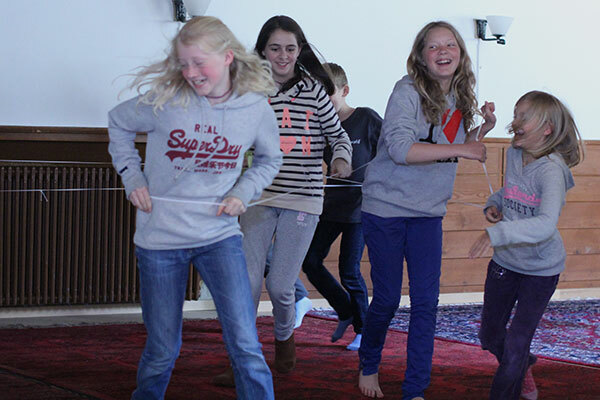 On a weekend in June, over twenty children and teenagers participated in the Family Camp 2013 of the Swiss Amma Center in Flaach. 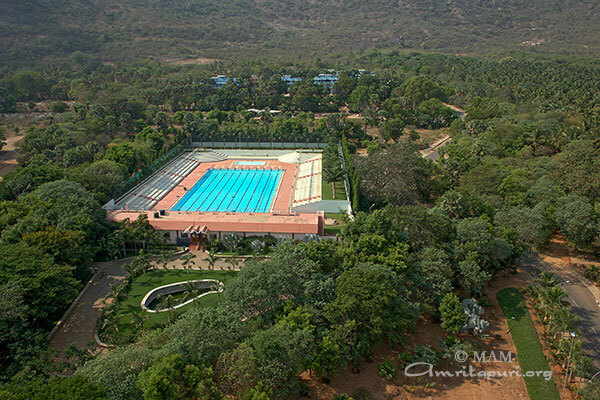 The theme of the camp was “Man and Nature in Harmony” with a special emphasis on water. 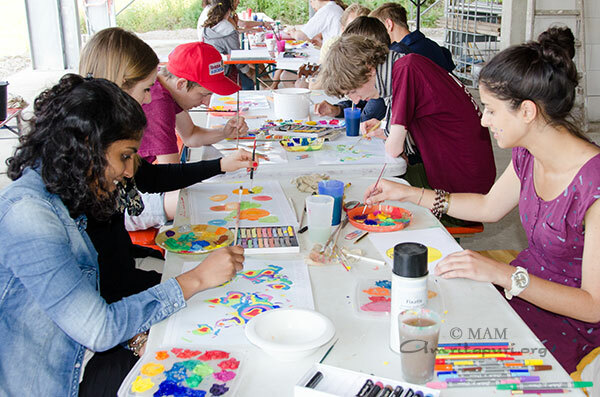 The children and teenagers participated, according to their age, in different workshops centered on the five virtues: Truth, Peace, Love, Non-Violence and Right Action. 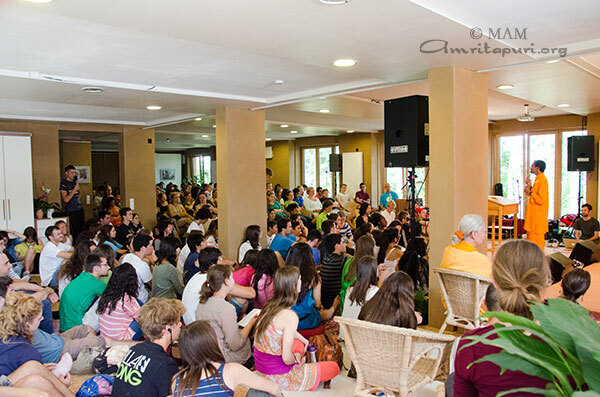 The two following days started with the Amrita-Yoga and IAM Meditation. 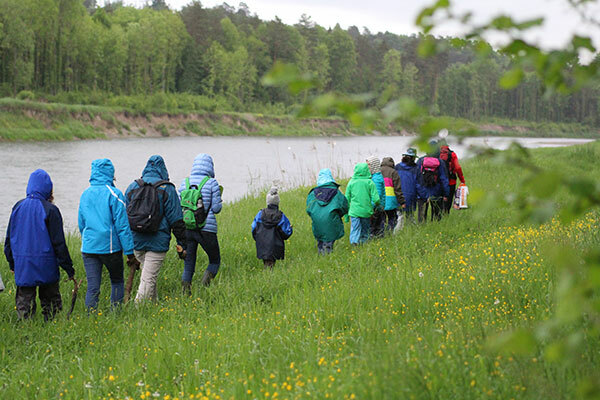 One of the many highlights of the weekend was the wonderful guided tour through the nature sanctuary “Thurauen” on Sunday morning, where everybody learned about the animals in the water and also had a lot of fun making their own boats made from materials found at the sanctuary: wood, reeds, etc. 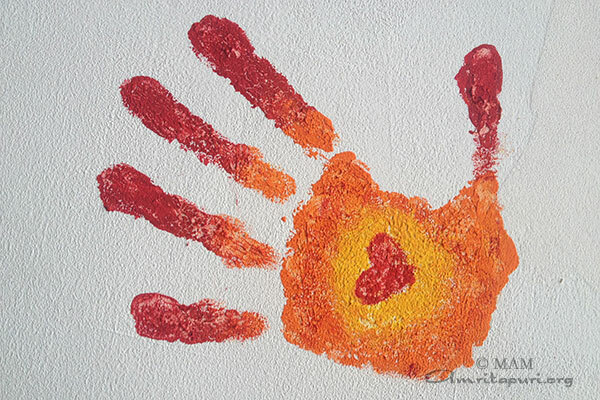 In the afternoon there were theatre and painting workshops, an IAM Refresher course and games for the small children. The day ended a huge bonfire and the sending small hot air balloons into the moonlit night sky while everybody chanted “Om Lokah Samastah Sukhino Bhavantu”. On Monday the retreat came to an end with the children each promising to do one good deed a day, as well as with dancing and singing together and presenting the theatre scenes all children had prepared. 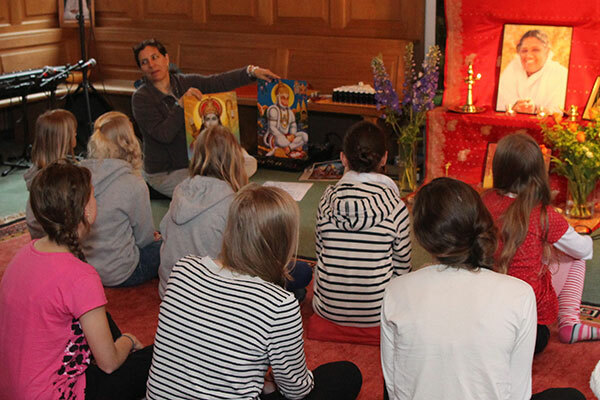 During the whole camp the children also had bhajan class and led their own bhajan sessions each evening. 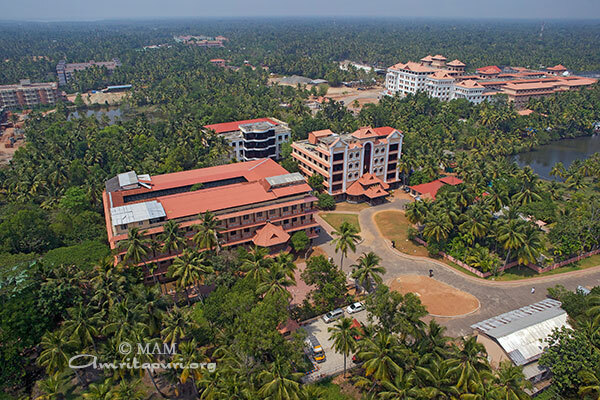 It was a wonderful weekend, where learning and fun were closely linked and where surely every child or teenager could return home with precious experiences in his heart. An Aerial view of Amrita Institutions: Amrita Institute of Medical Sciences; Amrita University Healthcare Campus, Kochi; Amrita University Campus Coimbatore; Amrita university Campus Amritapuri and Amritapuri Ashram. 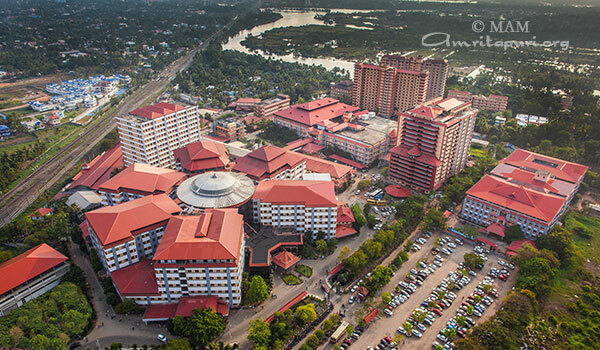 These pics are taken by Nikolas using kite aerial photography. 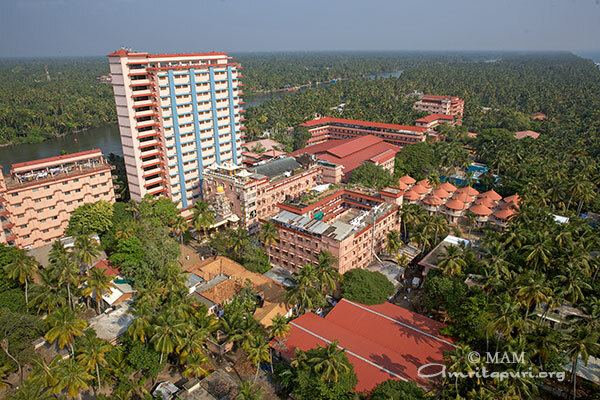 Using a kite, camera is lifted up in the air, with wireless controls one position the camera and the pictures are taken from the ground by a remote control.